over the course of my career, i've heard so many managers call a bad situation an 'opportunity' that it drove me nuts. why could they not simply call it what it was - a menace, an annoyance, misfortune or whatever. by why all this spin and political correctness? for years this bothered me, then it simply became amusing and finally it became an attitude after learning of stoicism. in the chapter entitled 'the discipline of perception' we learn of john d rockefeller and his secret to building an empire. in the course of his life, through multiple obstacles, rockefeller developed an ability to keep a cool head in the face of adversity. 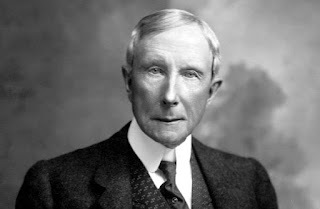 while his competitors would become fearful and anxious, and only see doom, and would cut and run, rockefeller would see opportunity and figure out a way to turn it to his advantage. another phrase that has bothered me over the years is a phrase i often heard in the last couple of presidential elections: 'never let a crisis go to waste' i guess it bothered me because the politicians who often used the phrase would exacerbate the social problems the crisis created. however, i don't think the phrase only applies to one political party. no matter the situation or crisis, we can choose to have an attitude that works t our advantage. in summary, those who are overcome with fear and anxiety should heed the example of rockefeller. seize the initiative; own the bad situation and train your attitude to figure out a way to make things work for you instead of against you. let me wrap up with some advice from the author. there are a few things to keep in mind when faced with a seemingly insurmountable obstacle.